Growing up in the second-largest metropolitan area in the Middle East (Tehran), I made a choice at young age to serve the society as an architect. After working as an architect, I came to recognize the need for non-motorized transportation and active living in the 21th century. Working in the field of landscape architecture, I engage in the practice of sustainability, respecting ecology, and enhancing the public realm to help humanity to have better outdoor places and cities to celebrate life. Hamed received his bachelor’s degree in architecture. After working for an architectural firm in Iran and working towards his master’s degree, he realized that landscape architecture could even better help him explore his talents. 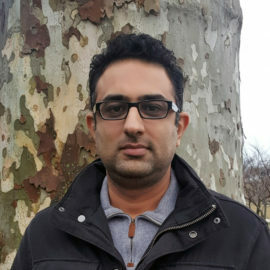 After moving to the United States and being inspired by the biodiversity of the northeast region, he achieved his master’s degree in landscape architecture from Temple University. His interest in watercolor paintings and hand drawings led him to win 2017 John Collins Drawing Award by PA/DE ASLA chapter. Hamed is passionate about transporting life in design, creating beautiful and healthy communities, streetscape design, parks and recreation, ecological restoration and ecological design.